Acariformis corpore molle familiae Argasidarum, prope ova quae nuperrime posuit. Aceria anthocoptes (magnitudo: 50 micrometra). Acariformis mas (magnitudo: 2 mm). Acariformis non agnitus super folium plantae. Imago microscopica..
Acari, vel Acarina, sunt taxon arachnidorum quod acariformes et parasitiformes continet. Diversitas Acarorum est extraordinaria, et eius historia fossilis saltem ad aevum Devonianum primum attingit. Acarologi ergo ad acaros describendos multiplices graduum taxinomicorum rationes proposuerunt. In pluribus tractationibus hodiernis, acari putantur subclassis Arachnidorum, quae constat e duobus aut tribus superordinibus vel ordinibus: Acariformes (vel Actinotrichida), Parasitiformes (vel Anactinotrichida), et Opilioacariformes; hic saepe putatur subgrex intra Parasitiformes. Eruditi de monophyletismo acarorum disputant, coniunctionesque acarinorum et aliorum arachnidorum non dum intelleguntur. ↑ Garwood, Russell J.; Dunlop, Jason A. (2014). "Three-dimensional reconstruction and the phylogeny of extinct chelicerate orders". PeerJ 2: e641 . ↑ Gerald W. Krantz & D. E. Walter, ed. (2009). A Manual of Acarology (3a ed.). Texas Tech University Press. ISBN 9780896726208 . Baker, E. 1952. An Introduction to Acarology. Novi Eboraci: The Macmillan Company. Krantz, Gerald W., et D. E. Walter, eds. 2009. A Manual of Acarology. Ed. 3a. Texas Tech University Press. ISBN 9780896726208. Niedbala, Wojciech. 1992. Phthiracaroidea (Acari, Oribatida): Systematic Studies. Varsoviae: Polish Scientific Publishers PWN. Amstelodami: Elsevier. ISBN 9788301097400. Experimental and Applied Acarology, Formula:ISSN (electronic) Formula:ISSN (paper), Springer. Proctor, Heather. 1998. Acariformes: The "mite-like" mites. Tree of Life Web Project, 9 Augusti. Archivum 2 Ianuarii 2008. Walter, David Evans, Gerald Krantz, et Evert Lindquist. 1996. Acari: The Mites. Tree of Life Web Project, 13 Decembris. Walter, David, et Heather Proctor. 1999. 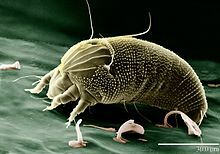 Mites: Ecology, Evolution and Behaviour. CAB International. ISBN 9780851993751. Walter, D. E., et H. C. Proctor. 2001. Mites in soil, an interactive key to mites and other soil microarthropods. ABRS Identification Series. Collingwood Victoriae: CSIRO Publishing. Woolley, T. 1988. Acarology: Mites and Human Welfare. Novi Eboraci: Wiley Interscience. ISBN 0471041688. Vicimedia Communia plura habent quae ad Acaros spectant. Lege de Acari in Vicilibris. Mark Harvey & Heather Proctor. "Key to Families and Subfamilies of Water Mites (Hydracarina) in Australia"
Novissima mutatio die 17 Iulii 2017 hora 15:50 facta.